Immediately following the War of 1812, the American army dispatched a detachment of the Regiment of Riflemen to Mackinac Island. These men were some of the most unique soldiers to ever serve at Mackinac. On July 18, 1815, peace returned to Mackinac Island after three years of war. At 2:00 in the afternoon on that day 200 years ago, British troops, some of whom had helped capture Fort Mackinac in the opening days of the War of 1812, peacefully returned control of the island to American soldiers and the United States. Now, two centuries later, a series of special events will culminate in the dedication of a new peace garden on Mackinac Island, celebrating the lasting peace between the United States and Canada. 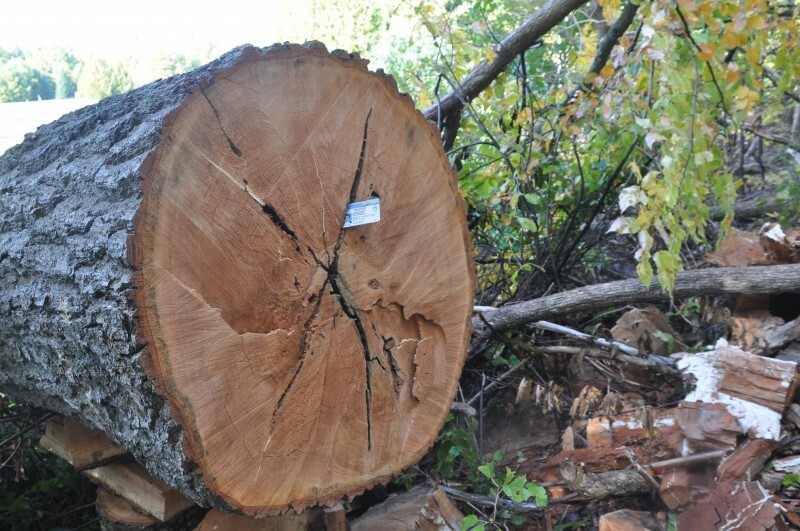 A enormous red oak at the Wawashkamo golf course on Mackinac Island fell after strong winds in July and has proven to have a history that far pre-dates that of the golf course. A cross-section of the 200 year old oak tree. A Michigan driver’s license is inserted to give scale to the image. In one of the first actions of the War of 1812, British troops surprised and captured Fort Mackinac on July 17, 1812. Two years later, 750 American troops attempted to recapture Mackinac Island. To counter the American attack, British, Canadian, and Native American troops took up positions on the fields of Michael Dousman’s farm. Here, on the afternoon of August 4, 1814, the two forces met and fought the Battle of Mackinac Island. An American defeat, the battle left Mackinac in British hands until the end of the war. In the center of the battlefield/golf course is a steep hill and stand of trees. In that grove sits the remaining stump of the red oak that Mackinac Associates Vice President Peter Pellerito, among others, believed could have been a “witness” to that American defeat. Pellerito arranged for a large cross-section of the tree to be examined by Dean Reid, a forester. Meticulously counting each ring and allowing for the height at which the section was cut, Reid determined the age of the tree to be 207 years old. Though very small at the time, there’s no doubt that this red oak was present during the battle. The bombardment of Fort McHenry took place on September 13th and 14th, 1814. Francis Scott Key, held captive aboard a Royal Navy warship, watched as the British attacked the fort and other defenses of Baltimore. 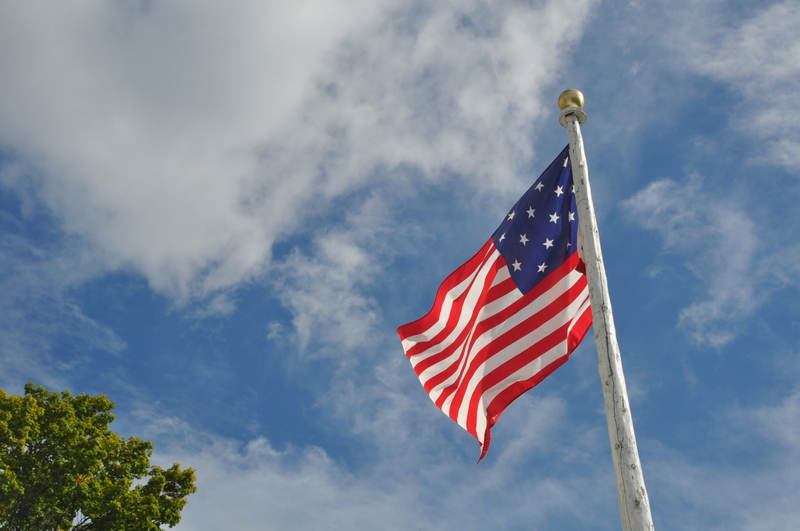 This flag at Fort Mackinac, though smaller than the one seen by Francis Scott Key the morning of September 14, bears the 15 stars and stripes. By the dawn’s early light of September 14, he saw that the American flag remained flying above the fort. The large garrison flag that Key saw flying that morning 198 years ago measured 30 by 42 feet and bore 15 stars and 15 stripes (one for each state). Inspired by the sight of the flag, that morning Key wrote a poem about the battle called “The Defense of Fort McHenry.” Later set to music, the poem became “The Star-Spangled Banner,” which officially became the National Anthem of the United States in 1931.